We start today's Feel Good Friday with some statistics that don't feel good. "In middle school, 74% of girls express interest in Science, Technology, Engineering and Math (STEM), but when choosing a college major, just 0.3% of high school girls select computer science." This info comes from Girls Who Code, an organization formed in New York in 2012 that works "to inspire, educate, and equip girls with the computing skills to pursue 21st century opportunities." During the academic year, their nationwide clubs offer computer science education and tech industry exposure to girls from 6th to 12th grade. For the last two summers they've operated a Summer Immersion Program. As they explain on their website, it's "seven weeks of intensive instruction in robotics, web design, and mobile development with engaging, career-focused mentorship and exposure led by the industry's top female entrepreneurs and engineers." For girls in the Bay Area, this year's programs are taking place at Intuit, Facebook, eBay, Twitter and Square to name a few. One of the statistics that Girls Who Code reported after the program in 2013 is that "99% of participants said they are considering pursuing a career in technology and 81% definitely intend to do so." You go, girls! You can get more information in this short article from PC Mag and since they are a technology focused organization, the best way to stay in touch is by using technology! 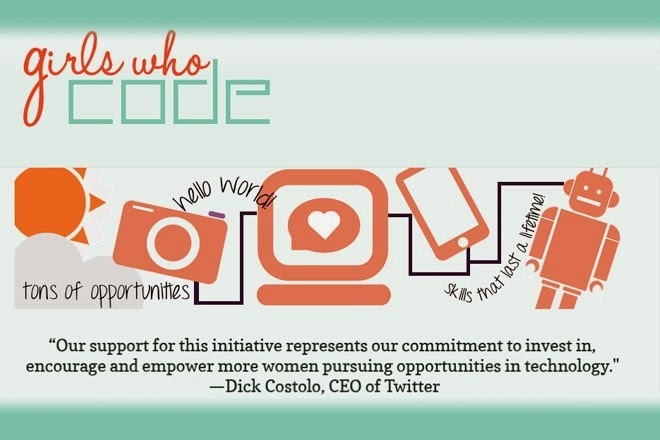 Like their Facebook page or follow them on Twitter @GirlsWhoCode. I've managed to do it and I was a Sociology major!